Proposed Paddling ban in French Pyrenees | DBP MAGAZINE ONLINE The World's Best Free Whitewater Publication. 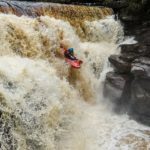 It’s recently come to be public knowledge that the Authority for the French Pyrenees national park is consulting on an order to ban whitewater paddling (among a whole range of other sports) within the park. The Pyrenees is a whitewater paddling destination for paddlers all over Europe, and in particular in the UK.